Ready Start™ feature: the engine will start after two pulls maximum if regular service was performed. No frustrating repeated pulls of the engine starting cable. 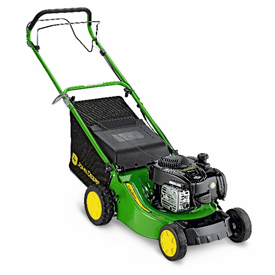 Briggs & Stratton is a trademark of Briggs & Stratton Corporation. 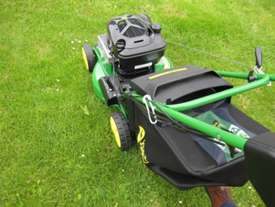 Mowing without fatigue is easy with the single-speed drive. Drive lever is positioned so that it allows engaging traction in various hand positions on the handle. Belt clutch is located on the transmission input for smooth engagement. Freewheeling when not engaged to allow pushing and pulling the mower easily for trimming and transporting. 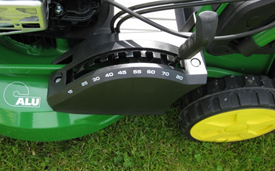 All RUN Series Mowers are equipped with a durable stamped-steel mowing deck. Smooth contours ensure good grass flow for a clean and efficient cut. The smooth deck also prevents grass sticking and is easy to clean with a broom or scraper. The lever is designed to prevent squeezing hands when adjusting it and to avoid catching branches with it when cleaning up the boundaries of a garden.